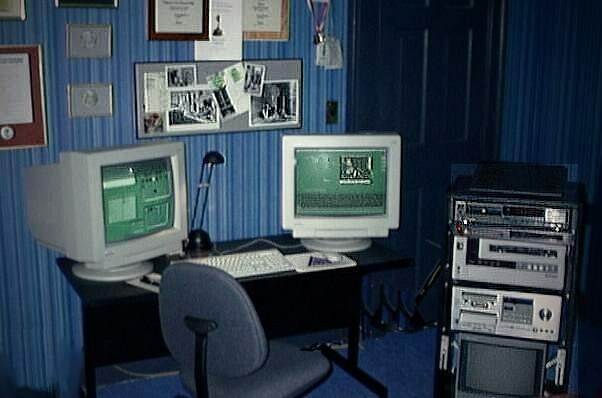 AVID Xpress Version 2.4 running on Apple Mac 9600 with 608 megabytes of RAM and a 400mHz Interex/XLR8 accelerator, AVR77 resolution, Blue ICE multi-processor graphics effects package, six 9-gigabyte SCSI media drives, ProTools w/plug-ins, Artel's Boris FX, Puffin Designs' Light factory, DigiEffects CineLook and Berserk software, BetaCam player/recorder, Pioneer V7400 for DVD video roll-ins, twin CTX 21" edit monitors, 12" Sony RGB broadcast reference monitor, five AR15 speakers for Dolby Surround playback, 38" RGB/Component Sony Wega XBR playback/review monitor, Nakamichi CD and cassette roll-in, triple 700 watt uninterruptible power supplies with advanced power filtering, custom Monster Cable wiring, and more, and more . . .